A velvety smooth gravy, expertly seasoned with rosemary, sage and onion. 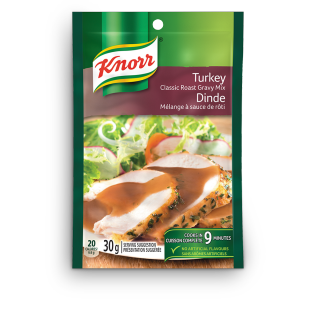 Perfect over roasted turkey or mashed potatoes. 1. In saucepan, whisk package contents into 1 ¼ cups (300 mL) cold water until blended. 2. Whisking constantly, bring to boil over medium-high heat. Reduce heat and simmer 5 minutes, whisking occasionally. Makes 1 ¼ cups (300 mL) gravy.